The last weekend of Weeks Of Action has come to a close and it was another fantastic one. This weekend we travelled all over the country to visit disabled supporters and their clubs to help promote this years campaign. Fans Liaison Officer Liam Bird had a very eventful weekend. On Saturday he headed up to FC United where he hasn’t stopped raving about how brilliant the club is since his return. When he arrived at the train station he mentioned that not even the horizontal rain could stop him or the passionate club celebrating this years campaign. He arrived at the ground and the weather had deteriorated even more. But what did he see in the distance. Only a few young people wearing Level Playing Field tee shirts. FC United were hosting a pan disability game with their academy and not even the rain could stop them. However, the rain was not done causing havoc. The men’s game was called off at 2p.m. due to a waterlogged pitch. Liam still got to meet with the club and with members of the DSA and was thoroughly impressed by what the club had to offer. On Sunday, he headed off to Wrexham to take part in the Community Cup which was a joint venture between Bellevue FC and Wrexham Disabled Supporters Association. This brought a number of different community organisations together to take part in a game of football. Unfortunately, Liam’s team were unsuccessful, however, he loved the Welsh hospitality and spoke very highly of everyone involved. Even if he is still black and blue from the match. 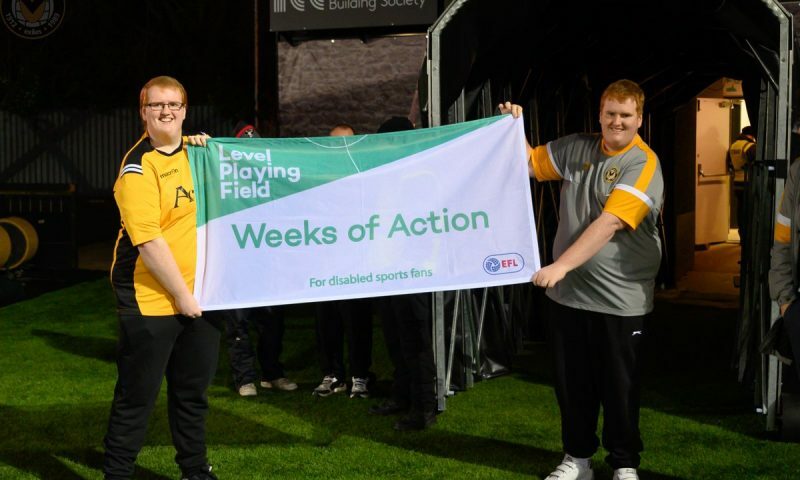 Chief Executive Owain Davies, visited his home country and took a trip to Rodney Parade to help Newport County celebrate this year’s Weeks Of Action. Newport County partnered up with local mental health charity my discombobulated brain to help raise awareness around mental health. At Newport County players were also warming up in Level Playing Field tee shirts to raise awareness for Weeks Of Action. Development Officer Neal Hickey and Chairperson Tony Taylor visited Goodison Park to help support their Weeks Of Action celebration. Rachael Lomax the club’s DAO showed the lads around some of the fantastic opportunities which are available for disabled supporters. Members of the DSA were also invited to take a photo on the pitch before the game and have a Level Playing Field scarf. Thank you to all of the clubs who took part in the campaign last weekend and please keep an eye out for next years dates coming soon.